The trend is clear -- businesses are under pressure to modernize and go digital, putting IT organizations squarely in the spotlight. In many ways IT is re-inventing themselves to become a business enabler instead of the traditional cost centre to provide services and solutions at a speed and efficiency never experienced before. Data protection has never been more in the forefront, as information increasingly is the lifeblood and differentiator in a constantly changing world. As the largest backup and recovery solution provider in the world, Veritas has the unique opportunity to engage with business leaders around the globe, across a wide range of public and private enterprises. 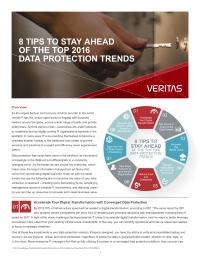 Keep up with the latest trends and download this paper to learn tips to maximize the value of your data protection investment — meeting more demanding SLAs, simplifying management across a complex IT environment, and reducing costs — so you can free up resources to innovate and create business value.